When trying to start the game of soccer, there are many things that come at the same time that become confusing. Things like the type of equipment to use, are they the right one or wrong one? The type of balls to buy, the type of jersey to purchase and so much more. Newbies are faced with the challenge of choosing the right equipment for the right game. Things that always give more problem is the type of ball to choose. For a teenager starting or for a player less than ten, or even an adult is faced with this challenge. That is why it is important we do this piece to guide people in making the right choice. The first thing to note is that deciding to play the game of soccer means that you have to be clear what your aim and objectives are. Do you want to go professional or just want to have fun doing it that is for recreational activities? This has to be establish because it determines the kind of materials to be used and the amount of investment needed in the game by such player. So by sorting all these out, the player can come to realize the best gears that he or she should invest in. The ball size he should buy and many more other information we will be talking about next. It is of great importance to note that playing soccer doesn’t mean you have to break the bank to get started. With some low amount of dollars, you could get all that is needed to start playing the game. This money will help get the best soccer ball to play real soccer. Best soccer ball means a perfect sized good quality soccer ball. Here we will help you to find out the perfect soccer ball according to your (or your kids) age and height. You can as well check here for the best soccer balls in the world. For those already playing under the supervision of a coach, it is best to seek their advice when making purchase of the best ball that suits him or her. Below is a chart on the different ball sizes and age bracket that they best suit. This is a ball that weighs 8-9 ounce with circumference between 18-20 inches. This is a ball most suitable for kids that their parents want to introduce to the game at an early age. These kids are always between age 3 and 0. By showing the kid this ball and allowing them play and train with it, they become use to it and start developing likeness for the game at an early age. With the size very small it won’t be overwhelming for them and they can easily grab it. This ball can also be used by adult but just for practicing and not professionally. When a professional player want to master a skill, its best he first practice with a size one ball before migrating to the standard ball. If you practice continuously with this mini soccer ball, easily you can improve your soccer skills (dribbling, passing, shooting, finishing etc.) with amazing ball control. This is a type of soccer ball that weighs 10 ounce with circumference between 20-22 inches. The age range for this ball varies with that of size one. Kids of ages three to five can comfortably use this ball to practice. As noticed by the size, it is bigger and will be of perfect size for kids of that age bracket. It is also very important that these kids are given the right ball to train with and enjoy themselves. With this type of ball, they will develop at the right pace and be ready for the bigger challenge. The ball is also useful for skill practice for professionals. It has a weight of 11-12 Ounce with circumference of 23-24 inches. This is the type of soccer ball that young kids starting off at academies are introduced to. They mostly fall in the age range of 6-8 years and at this level, they are eligible to be enrolled at acedmies and also they understand the need to play football. They also start having role models, so practicing with a size three ball was just the least that could be done in setting them up for what the future holds. This is the ball that weighs 11-13 ounce and have circumference 25-26 inches. This is the ball that is used for youth age grade competition for kids between ages 9-12 years. This ball goes a long way in getting them prepared to be professionals as it’s sometimes used by adult. This ball size is also used by adult in indoor soccer or futsal. Also, protections are very crucial when trying to go professional in football so I would suggest soccer players of this age should start adopting how to make use of the best soccer shin guards. This is the standard ball we all know and see professional play on international competition. They weigh 14-16 ounce and have circumference 27-28 inches. Size 5 is the FIFA standard soccer ball and recommended for 13 and older players. So for players that aren’t using the right size of ball, especially those that want to go professional, this should set the way straight for them. The fact that soccer ball is a universal substance, there are some rural areas across the world where compromise are used as their ball just to train and as they grow older they get the standard ball. That is in extreme situation and if noticed, most of the players from such background are not as grounded as those that train with the right ball size under the right condition. 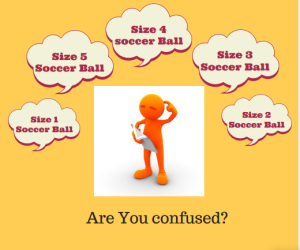 This piece have highlighted the different soccer ball sizes and the age grade that each is meant for. This piece meant to serve as a guide in making the right choice. It is in no way a mandatory or compulsory source to follow when choosing a soccer ball. Our guide have however been helpful in the past and we hope this also come in handy.